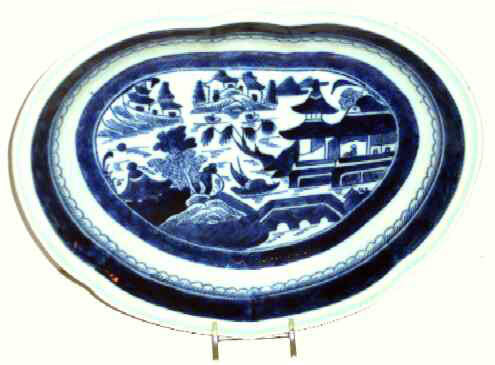 Presented here, an absolutely drop dead gorgeous Chinese Export Porcelain Canton Serving Dish/Fruit Plate. The colors are vibrant and the brushwork is very detailed. Decorated with small boats and pagodas in a mountainous landscape with the cloud-and-rain border. 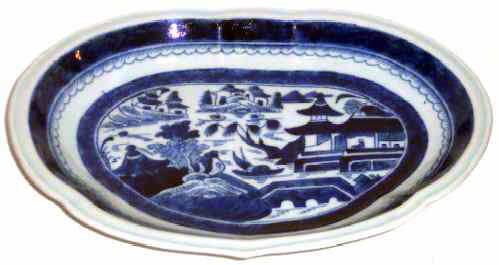 The underglaze blue is a wonderful cobalt color and the condition is excellent. C. 1830-40. Wonderful form and excellent detail. 8-1/4" wide x 10-3/4" long.